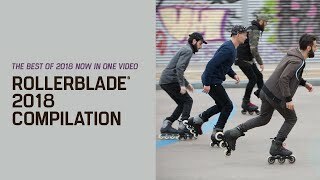 Rollerblade® has opened the team archives and wondered… “What are they up to now?” In the Flashback series of interviews, we catch up with former Rollerblade® team riders and creative minds that helped grow the brand. We talk about the past, present, and future. This time we Flashback with Fabiola Da Silva from Brazil. 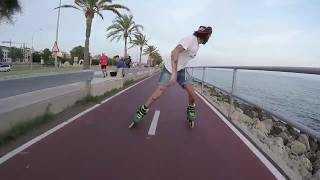 How did you get into inline skating? I started skating in Brazil in 1992. I saw some kids rollerskating around my neighborhood and I thought would be so fun to try to skate. I asked my father for a pair of skates. I had no clue how to skate. So I started in my backyard. I fell in love with skating from day one. I learned very quickly all the basic moves. 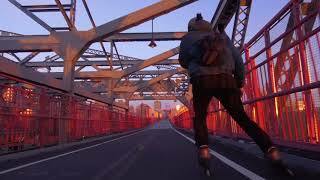 I loved it so much that I could not wait for every weekend to come so I could skate. Then I started skating parks, and all the places that had a good surfaces. When did you start skating street and ramps? Skating became so popular that new skate parks were built with small ramps. A few kids from my neighborhood used to skate the park. The first ramp I tried to drop in it was a small mini ramp. It was an amazing feeling! I was so driven to keep trying that I never gave up. Ever since the late 90’s you’ve maintained a top 3 spot in big competitions. The list of results is endless and impressive. What is your most memorable event and result? I’ve always skated around more guys than girls. I always felt that I could skate and do tricks just like them. I’ve always looked to them for challenges and did my best just to be as good as they are. When competitions let women skate against men that really pushed me to be better and better. Eventually I became one of the best out there. I was skating more and conditioning my body in the gym. Guys are naturally stronger than girls but that does not mean girls can’t be in as condition as they are . We can! The most memorable moment to me is when I learned how to do a double backflip. The first time I landed it was in Paris, France. I was so happy and felted so blessed. I could not believe that I did it. Then I finally landed it in a major competition on the ASA Pro Tour in California USA. I saw Taig Kris doing that trick years before and I told myself, “My gosh this trick is crazy. I’m never going to do that. It’s insane!” Two years later I landed it. I’m the only girl in the world that does that trick. I feel so blessed and happy with everything that I’ve accomplished with skating. Are you still skating ramps often? Do you still have all your tricks from back in the day? Yes I’m still skating ramps and street. Skating is part of my life. I skate 3 times a week! I still do all my tricks except the double flip. I haven’t done it for a while. It’s a hard and scary trick. That special trick I like to train that all the time so I feel confortable. I also skate Vert and Fitness too. I’m always going to be on my skates! You are hosting skateclinics and teaching people how to stay healthy and fit. Are these focused on basics or also ramp skills? I do a lot of skating clinics. My clinics are based on teaching kids how to skate, stay active, healthy and the importance of playing sports. The most important is a healthy life. We all need to learn what we can do to contribute for a better quality of life. I teach the basics of skating (beginners), fitness skating and ramp skills. I have many kids and adults for all the modalities. Whatever I can do to help others achieve their goals and have a healthier and better life style! I am here to help. What else do you do to stay fit and in good health? Besides skating I do a lot of conditioning training and crossfit. I love to train and be healthy. I follow a very healthy meal plan with lots of greens, protein and good carbs. I really learned in this past years how important is to have a clean diet. Know to select all your foods. I learned more on how to choose healthy greens, proteins, and carbs! Nutrition is the key for a longevity and healthy life. Any new plans coming up you would like to share with us? Since I live and breathe sports... About a year ago I opened up a food company called EAT2LIVE. It’s all frozen healthy meals. I serve all around São Paulo Brazil. This way I can teach people how to stay healthy and have a better longevity of life. 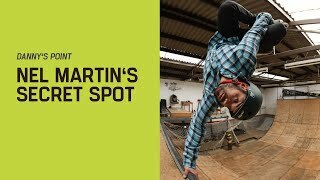 As for skating, I travel all around Brazil and outside doing clinics and speeches about skating, faith, sports, and nutrition! Skating is my life! With all my experience that I have, now I want to help and motivate people to have a better life and to reach their dreams. Through sports we change lives.